4.11 The Gathering Storm mapboard consists of a map showing the center of Europe, from Spain in the west to Russia in the east, and Scandinavia in the north to the Mediterranean in the south. 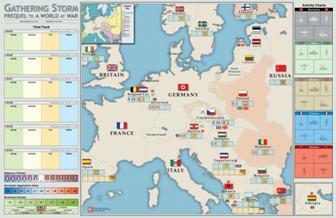 4.12 MAJOR POWERS: Each of the five major powers that participate in Gathering Storm (Germany, Italy, Britain, France and Russia) is depicted on the mapboard. 4.13 MINOR COUNTRIES: All minor countries depicted on the mapboard with their national flags play a role in Gathering Storm. Denmark, the Netherlands and Switzerland do not, although Denmark and the Netherlands may be involved in A World at War. A. DIPLOMACY: Minor countries that contain a light blue shaded four-box diplomatic track are diplomatic targets; Russia is a special case. At the start of the game, major power flags and trade pact counters are placed on each minor country’s diplomatic track to indicate the diplomatic alignment of the minor country. 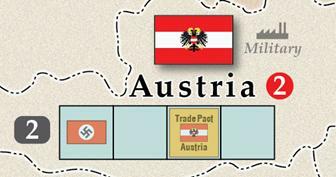 For example, Austria contains a German flag at the start of the game. Each diplomatic target’s trade pact counter is placed in the third box on the diplomatic track for that country. When an alliance places three flags in that country, one of the major powers transfers the trade pact counter to its scenario card. Belgium/Luxembourg and Czechoslovakia have trade pacts with France at the start of the game, so their trade pact counters are placed on the French scenario card during opening setup. B. DEFENSIVE STRENGTHS: The basic defensive strengths of minor countries that are potential victims of Axis aggression are printed on the mapboard in a dark grey box. Some minor countries have a second, reduced defensive strength which applies if part of their territory has been occupied (Czechoslovakia, Poland) or if they are engaged in a civil war (Greece, Yugoslavia) (28.2). C. AGGRESSION VALUES: The aggression values of minor countries that are potential victims of Axis aggression are printed on the mapboard in a red circle. Aggression values determine the number of additional random events drawn by Germany and Italy (9.14) and the number of victory points earned by the Axis (34.51). D. FACTORIES: Successful German aggression against the Rhineland, Austria and Czechoslovakia results in the German acquisition of an idle (Rhineland) or military (Austria and Czechoslovakia) factory, as indicated on the mapboard. 4.14 CIVIL WARS: Minor countries that contain light gold shaded five-box civil war tracks (Greece, Spain and Yugoslavia) may have civil wars (25). A. A civil war counter for the minor country is placed in one of the civil war track boxes when a random event occurs that brings the civil war closer. When all five cells are occupied, a civil war breaks out. Civil war counters are then removed as the civil war is fought; the civil war ends when all five civil war counters are removed. B. At the start of the game a tile is drawn and one, two or three Spanish civil war events are considered to have occurred before the start of the game; Greece and Yugoslavia begin the game with no civil war events (and are therefore less likely to have a civil war than is Spain). 4.15 RUSSIAN BORDER STATES: The diplomatic alignment of Finland, Poland, Rumania and Turkey affects the Russian garrison requirements (21). These Russian border states are shaded light red. E. BALKANS: Albania, Bulgaria, Greece, Turkey, Yugoslavia. A. TIME TRACK: The turn marker is moved on the time track to indicate the current turn. When units are mobilized, they are placed on the box for the turn in which they come into play (14.8). B. BALANCE OF POWER TRACK: This is used to track the Axis-Allied balance of power (20). 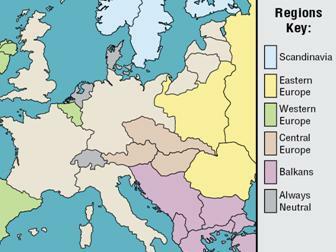 C. EUROPEAN AGGRESSION INDEX TRACK: This is used to track the EAI (23). D. ECONOMIC CLIMATE TRACK: This is used to track the economic climate (11.3). E. ACTIVITY COUNTER TRACK: Once activity counters are used, they are placed in the appropriate box of that major power’s activity counter track, so that they aren’t inadvertently used again during that turn (12).